Technical Editor Ron Horner tests the brand-new JCB Hydradig 110W, an 11.2-tonne digging, lifting, tool-carrying machine that looks like a rubber-tyred excavator but is so much more. There are some days during this period of my life of semi-retirement that I wake up and just have to pinch myself and ask, "Is this real?" I just happened to have one of those days last week when I got the phone call from Dave the Editor asking me if I could have a play with the just-released JCB Hydradig 110W rubber-tyred excavator before it headed off to a happy new owner (one of many fighting to purchase one). Now I’ve spent 45 years buying, operating and specialising in excavators and you will have to look far and wide to find someone with more passion for these machines … but I have to admit I’ve had a total dislike for rubber-tyred excavators. My opinion has always been that they are just a token gesture to appease a small number of ‘backhoe-lovin’ loonies’ who refuse to let go of the backhoe image. However, JCB has proven to me before that the industry has changed significantly and that its engineers are always listening to operators’ feedback (see our review of the JCB 1CXT tracked loader for an example). JCB just happens to be one of my most favourite heavy machinery manufacturers. The company always comes up with something innovative, versatile and totally out of the box, and from what I could see this new digging, lifting, tool-carrying Hydradig ticks them all. So, I figured, they have changed my thoughts a couple of times before so maybe this is another game-changer. No need to ask me twice! Now as I said, the JCB Hydradig is a super-versatile 11.2-tonne wheeled excavator which can be used as a digging, lifting, tool-carrying machine suited to a wide range of applications, from general construction to utilities, highways, municipalities and landscaping. It runs an 81kW (109hp) JCB T4F EcoMax 444 diesel engine (co-designed and built by Cosworth), and comes with a 0.31-cubic-metre bucket. JCB has designed it with a balanced 50/50 weight distribution front to rear, which removes that ‘nod and pitch’ so typical of any rubber-tyred, road-going item of plant. Having been purposely designed and built from the ground up, the Hydradig’s ‘firsts’ just keep jumping out at you. First thing I noticed about the excavator is that the engine, tanks and ancillaries are mounted in the chassis instead of in the upper structure. This creates a lower point of gravity and super-impressive visual lines both from the ground and, more importantly, from the operator’s cabin. 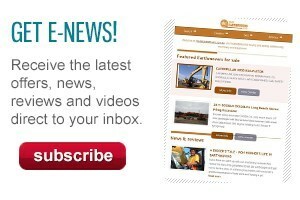 Safety in construction is paramount, and if you can design a safety problem out of the equation, then do it. Because JCB’s engineers have looked outside the square and moved the engine out of the upper bodywork, there is no requirement for additional handrails, mirrors or a rear-view camera. Now that’s a first in my opinion. Brilliant! This advanced version of an integrated tool carrier has the added benefit of a safe working load (SWL) of 1000kg at full extension (should you be looking at a crane or forklift operation), can get from job to job or across site at a healthy 45km/h, and has a brilliant 4m turning radius. 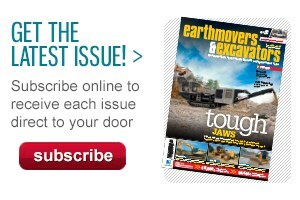 Head into digger mode and the optional hydraulic attachments and buckets are endless. The Hydradig 110W comes standard with a 600mm-wide JCB-designed bucket, JCB quick-hitch and several auxiliary hydraulic lines of varying diameters fitted within easy reach on the dipper arm, and an optional attachment list as long as your arm. You are going to be a very difficult-to-please customer if you can’t be satisfied with this one. As I settled in to the well-designed and well-laid-out cabin I realised just how good that panoramic view is. It gives a clear line of sight to all four tyres as well as a full 360-degree view and 1m of vision at ground level. Add the close-radius rear tail wing of just 120mm and, well, you know you have something pretty special here. Adding to the awesomeness is a 7-inch monitor, fully adjustable steering column, rotary control hand throttle (and foot), mechanical suspension seat, 12V power socket, radio, sunblind, and climate control air-conditioning. The coded lockout ignition system reduces theft opportunities and the multi-functional hand lever controls and dash layout make this one lovely little machine to operate. 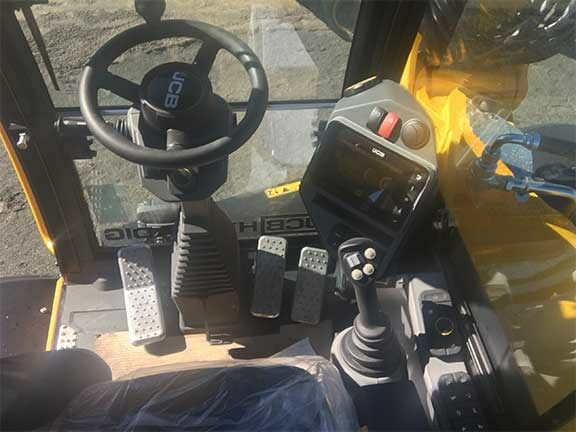 With the ability to flick from excavator to backhoe mode for side digging and to flick to travel forward and reverse, and with a combination of buttons and switches in easy finger-tip reach to control the rest of the machine operation, the operator is really ‘King off the Road’ with this one. 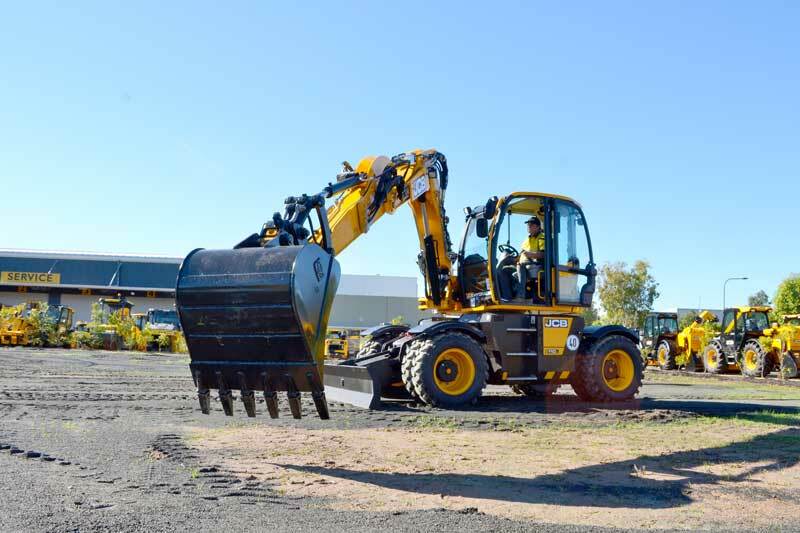 This demonstration/test run had to be carried out in JCB Construction Equipment Australia’s Brisbane yard in pretty wet conditions, so we could not give it a total work-out and get down and dirty with it – as much as I wanted to! That said, we had a pretty good run with it, and were able to get an idea of this innovative machine’s capabilities. The three-piece boom and dipper on our Hydradig extended almost vertical for a maximum digging reach of up to 8m, and down to a max digging depth of up to 4.4m. The well-positioned front blade is suitably designed for good operator vision and acts not only as a weapon of choice when dealing with that loose on-site material clean up, but also as a perfect stabilising tool for crane lifting, digging and parking up on those steep locations. The Hydradig has 2WD, 4WD and crab-steer options as standard, ensuring an easier, more comfortable feel when working the ‘tights on sites’, but what is new is the reverse-steer option where the operator can change the back of the machine to the front if so desired. Having 9.00/20 ‘duallies’ front and rear, as well as well-designed stabilisers, enable the operator to push the boundaries of side stability to the limits and still keep within the manufacturer’s guidelines. The steering options available on the Hydradig make it a great machine for those confined workspaces in metro jobsites, and the stepless hydrostatic transmission ensures maximum traction and manoeuvrability on tough terrains. If you have to run the night shift (you lucky bugger), don’t worry about eye strain as this machine has low-level glass, those excellent levels of sight and optional LED work lights. The two lights on the boom, two on the cab front, two attached to the cab rear and two side-fitted (halogen) lights turn night into day at the click of a switch. 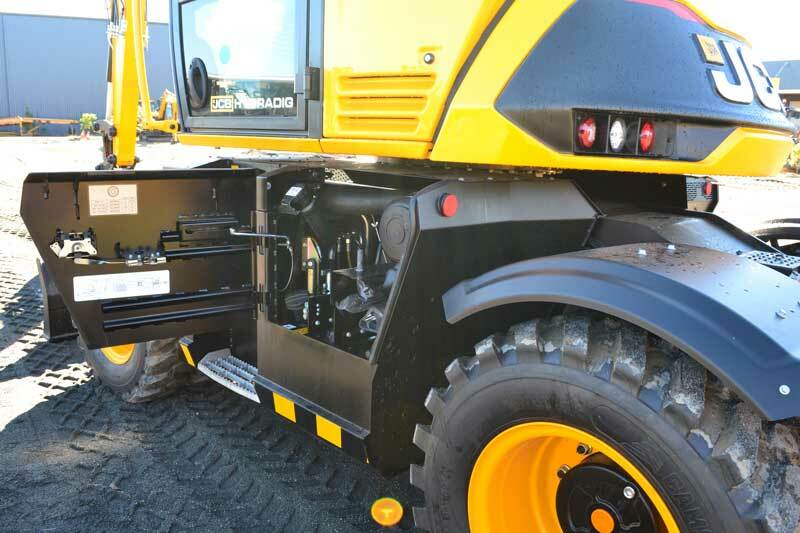 A sure-to-win-approval design incorporated into the Hydradig is that all daily service checks and regular maintenance can be safely carried out from ground level, with a lift-up canopy providing excellent access to the engine and filters, fuel and radiators. Another tick for JCB as this reduces downtime and improves on-site safety as there is no working-at-height requirement. One good thing about JCB (CEA) that I am always extremely grateful for is that they give us the opportunity to test run and review every single new machine that comes onto the market without question – a sure sign of confidence in the end product. And their knowledgeable and friendly team is always there to give us assistance and guidance when or should we need it. On this particular test, JCB opened up specifically on a Saturday so we could review this machine due to the fact that unusual winter rains had hit us and prevented our mid-week pre-planned viewing. While doing this test, I spoke to a prospective buyer who told me he had several ‘rubber duckies’ of different makes in his fleet. 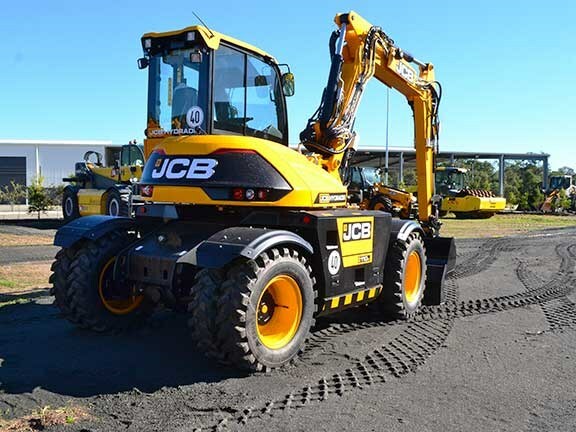 He said he had had to import them himself from overseas and that the local distributors had assisted in servicing and repairs but, as this wasn’t an ideal situation, he was ever so keen to see that JCB was importing and distributing the Hydradig here in Australia. "I am looking for a one-stop-shop, Ron, and this Hydradig deal from JCB CEA suits my application to a tee," he told me. JCB has once again ticked so many boxes. The opposition had better get a good pair of running shoes on if they want to catch JCB on this one. The JCB Hydradig 110W is a ‘two thumbs up’ winner.